The open coil elements are the most popular in the industry, suitable for most standard HVAC ducted systems. The biggest advantage of these elements is the excellent heat dissipation capacity with heating capacities ranging from 0.5 to 1000 kW. • Up to 40 kW per sq.ft. The grade C open coil elements type is made up of nickel, chrome and iron. Neptronic® offers, for applications in humid environments, NiCr 80 (grade A) elements which do not contain any iron. The Standard and Finned tubular type offers an excellent mechanical resistance, suited for demanding environments. 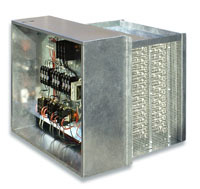 These elements are less sensitive to humid and dusty environments but offer a slower response time. • Up to 13 kW per sq.ft. (Standard) and Up to 15 Kw per sq.ft. (Finned). • Heating elements not in direct contact with air. • Element of U or W shape. Tubular elements are made of Incoloy 800 (Nickel alloy) tube with a diameter of 3/8” (9.5mm) which contains a heating coil in magnesium oxide powder. Finned tubular elements have aluminum fins installed on the tube to allow a higher heat dissipation capacity. 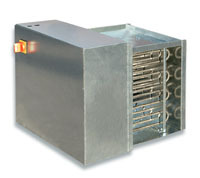 NEP - Therm heaters are designed to complement heating systems of homes and offices by preheating fresh air or returned air with any existing central forced-air heating system. This electric duct heater is equipped with a modulating controller that allows operating in extremely low air flow with peak performance. • Heat recovery ventilation system. • Central forced-air heating system. • Air make-up combined with a small fan. • Zone heater…. and more. • 6" or 8" collar; 1 kW to 5 kW at 120, 208 or 240 VAC. • 5 different kits of thermostat configuration available.